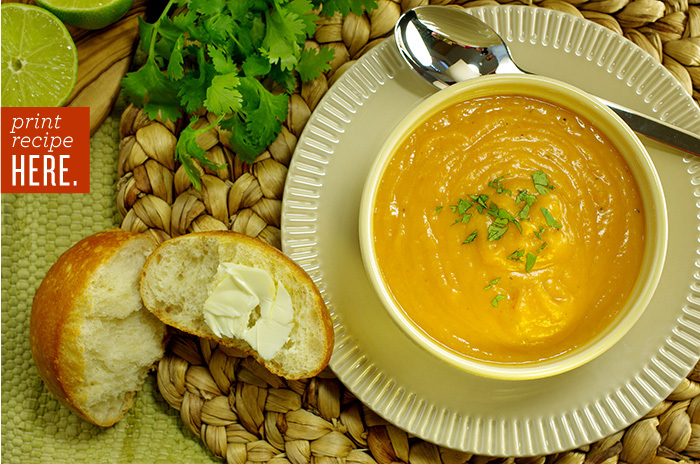 Chef Jeff loves to make squash soups during the fall. He flavors them with apples and sage or with fresh ginger and orange, or sometimes with just a little cream and black pepper. When you make soup every day (for five years and counting), the challenge is to keep things interesting for both yourself and your customer. 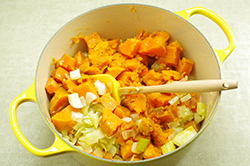 To branch out, he started playing around with sweet potatoes, using the same basic flavor variations as he uses for squash. 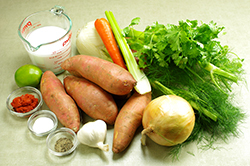 The starchy potato made for a much thicker soup, which our customers loved for its heartiness. Looking around the kitchen for inspiration one day, he noticed the coconut milk that we use in pastry for coconut pastry cream, and he threw it into the soup. A can of Thai curry paste caught his eye and it went in as well. The creamy sweetness of the potato is the perfect foil for the rich coconut milk and spicy curry paste, and now this is one of our most requested soups at Fort Point. 1. Preheat the oven to 400°F/200°C, and place a rack in the center of the oven. 2. 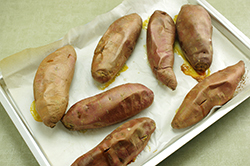 Place the sweet potatoes on the baking sheet and pierce each one several times with a knife tip or fork. Roast for 1 to 1-1/2 hours, or until they can be easily pierced in the center with a fork. Set aside to cool. 3. 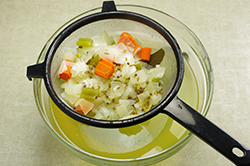 In the stockpot, heat the vegetable oil over medium-high heat. 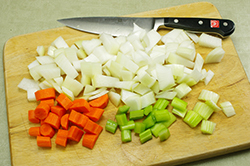 Add the onion, garlic, carrot, celery, and fennel; reduce the heat to medium-low; and sweat the vegetables, stirring often with a wooden spoon, for 6 to 8 minutes, or until they soften and the onion is translucent. 4. 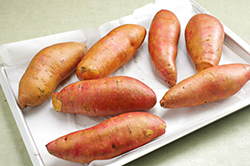 Peel the cooled sweet potatoes, cut them into large chunks, and add them to the vegetables in the stockpot. 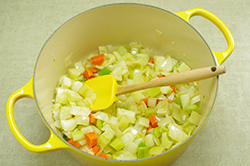 Add the stock, raise the heat to medium-high, and bring to a simmer. 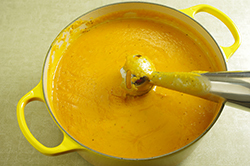 Reduce the heat to medium-low and simmer gently for 20 to 25 minutes to blend the flavors. 5. Turn off the heat and add the coconut milk, curry paste, salt, and pepper. Working in batches, blend the soup in the blender until very smooth. 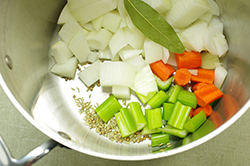 Return the soup to the pot and bring back to a simmer. Taste and adjust the seasoning if needed. 6. 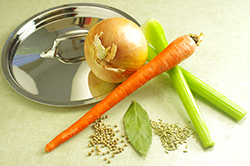 Ladle the soup into bowls and garnish each with the cilantro and a squeeze of lime before serving. 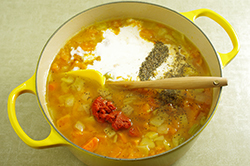 The soup can be stored in an airtight container in the fridge for up to 3 days or in the freezer for up to 1 month.